Edie McClurg plays the ditsy school secretary Grace, whose initial full name in the novelisation was given as Grace Vine. As school secretary she reports to principal Ed Rooney, and while she isn't working she likes to sniff liquid paper, and participate in gossip about students. 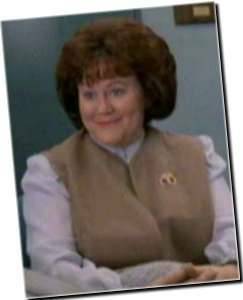 Born on 23 July 1951 in Kansas City, Missouri, Edie McClurg was 35 years old at the time of shooting. A regular face on TV and in film, McClurg started her career in the 1976 variety show called Tony Orlando and Dawn, otherwise know as The Tony Orlando and Dawn Rainbow Hour. Her first motion picture was the horror movie Carrie starring John Travolta and Sissy Spacek (in the role that gained her a Best Actress Academy Award Nomination). Since then she has gone on to appear in many films, the main few being several Cheech & Chong films, The Secret of NIMH, Mr Mom, The Little Mermaid, Curly Sue, Elvira, A River Runs Through It, Airborne, Natural Born Killers, Flubber, and A Bug's Life (a great movie!). She also worked with fellow FBDO cast member Louie Anderson (Flower Deliveryman) in his TV series, Life With Louie as the voice of Mrs Anderson and appeared on Melrose Place. She'll perhaps be best known however for her role as Patty Poole in Valerie Harper and Jason Bateman's TV series Valerie, aka Valerie's Family aka The Hogan Family.